On Saturday, we went to a big soccer game. 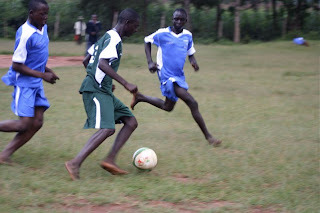 Oasis of Hope House boys vs. Oasis of Hope Street Boys. 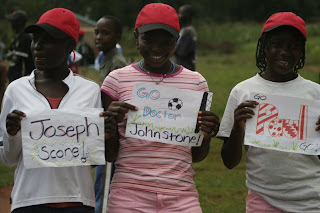 We made a sign for each of the boys and then passed them around for the house and street girls to hold...they chose their favorite boys...I held the signs for Johnstone (who makes the best Chapati in Kitale), Kevin and Edwin. 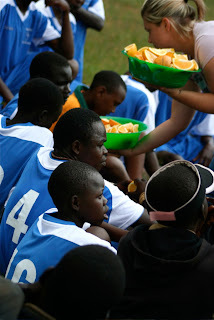 Lydia bought "team mom" half-time snacks: oranges and biscuits with water...Cutting oranges and passing them out to the boys amidst a mix of "asante"s and "thank you"s made me really excited to be a mom someday and do stuff like this. 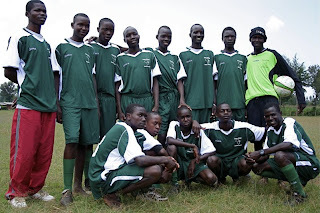 I fought back tears as Lydia shared with me story after story about the various boys on the field...I just love them. I can't imagine how she feels. In the end, it came down to a shoot-out and the Street Boys won the game. Lydia is amazing!! I LOVE the oranges! Did you have Capri Suns too? 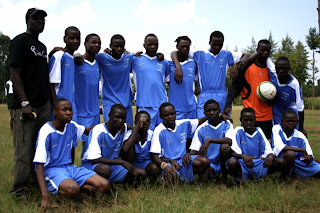 I remember hearing the Johnstone was the best chef in Kenya! I'm gonna see if I can make some chapati too!! Can't wait to take cupcakes to class, slice fruit to pass out on a summer day...have all the kids come over to our house for snacks!